Inspired by the film directed by Guillermo del Toro, enthusiast of Japanese anime, comes the official Pacific Rim digital downloadable game. The DLC game unfolds in the year 2013 when giant creatures suddenly appear out of the deep waters of the Pacific and systematically attempt to destroy the major cities of the world, threatening mankind’s very existence. Humans decide to stand up to the massive monsters by pooling their wisdom to develop colossal, humanoid fighting machines known as Jaegers. The Pacific Rim Xbox Live game recreates the epic battles between Jaegers and Kaiju depicted in the movie. Del Toro talks gaming in the video below. 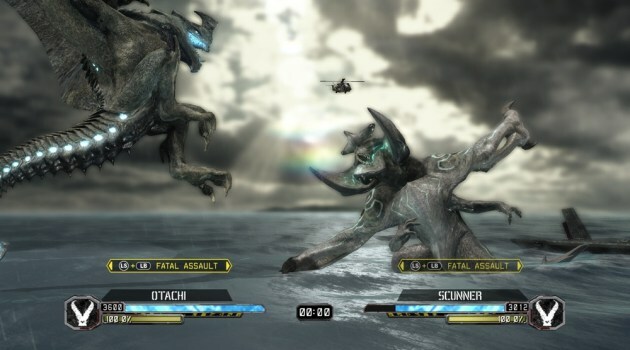 The character models that appear in the game were created from the same model data used in the film, allowing the Jaegers and Kaiju in the game to remain true to their original forms. Each Jaeger and Kaiju is unique in design, with their own weapons and fighting styles, meaning players will have to alter their tactics to account for the attributes of their character and opponent. This includes using a plasma cannon against a flying opponent, or using speed to your advantage against a bulky giant. The game features a variety of battlescapes, from ocean waters to city, and also contains the breathtaking building destruction seen in the film.Players can join one of the online teams to battle against other users around the world. You can also pit one Kaiju against another to create match-ups not featured in the film. Additional downloadable content that expands the playing field will be released, including more Kaiju from the film, new battle stages, and extra missions. This content will give users more options for assembling and customizing their own personal Jaegers, which can be used to combat the diverse fighting techniques employed by the Kaiju. Oscar nominee Guillermo del Toro (Pan’s Labyrinth) directed the epic sci-fi action adventure Pacific Rim from a script by Travis Beacham and del Toro, story by Beacham. Thomas Tull, Jon Jashni, del Toro and Mary Parent produced the film, with Callum Greene serving as executive producer and Jillian Zaks co-producing. The film stars Charlie Hunnam (TV’s Sons of Anarchy), Idris Elba (Thor), Oscar nominee Rinko Kikuchi (Babel), Charlie Day (Horrible Bosses), Rob Kazinsky, Max Martini, Clifton Collins, Jr., Burn Gorman, and Ron Perlman (the Hellboy films). Del Toro’s behind-the-scenes team included Academy Award-winning director of photography Guillermo Navarro (Pan’s Labyrinth), production designers Andrew Neskoromny and Carol Spier, editors Peter Amundson and John Gilroy, and costume designer Kate Hawley. The music is composed by Ramin Djawadi. The visual effects supervisors are John Knoll and James E. Price and the animation supervisor is Hal Hickel. Warner Bros. Pictures and Legendary Pictures present a Legendary Pictures/DDY Production, a Guillermo del Toro film.